As Cab travel business are largely dependent on the communication of the customers via SMS and Calls they wanted us to provide the drivers with solutions that will help in tracking and to rely on. Furthermore, they wanted to keep the customer and driver phone numbers confidential from each other and to ensure smooth flow of call patching between cab driver and customer. Cab travels are entirely dependent on calls received from the customers either from SMS & Calls. All they required a solution that includes calling between customer and driver. When the driver calls to the customer the numbers should be kept confidential from each other with the help of number masking. SMS Striker suggested the usage of Cloud telephony solutions as the best solution for this type of unique requirement. The drivers of this cab business can now call to the customers using Strikers Soft Solution’s Virtual number. This virtual number enables drivers to connect with the customers by just click of a button. Phone number masking is used as it is an effective solution to safeguard the privacy of the customers and it serves the purpose to bridge and safeguard their respective identities. Virtual number of Cloud Telephony helps to streamline the complicated process in a simple and easy way. 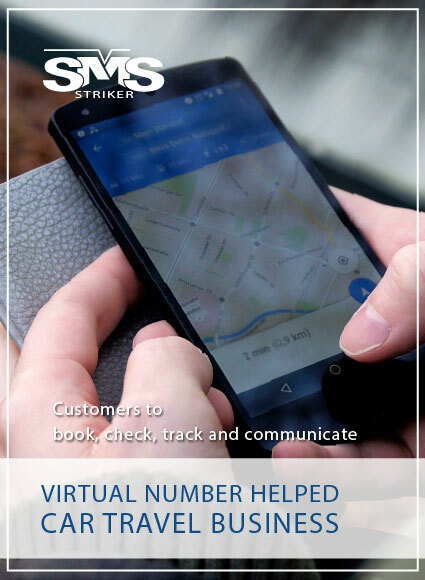 By using Strikers Virtual phone number, the customer’s privacy is well maintained as the driver cannot view the customer phone number and customer too cannot view the driver phone number. Furthermore the updates and engagements are made via automated SMS and IVR calls with no Human intervention and no wastage of time.